Castlegar artist Mirja Vahala specializes in teaching painting to true beginners. After a flood of requests from her students, the internationally-acclaimed artist and instructor, who was once the artist-in-residence for Holland America Cruises, decided to create an instructional DVD. The end result, entitled “Acrylics for True Beginners” was directed and edited by Miriam Needoba of Small Town Films. It was a Needoba who suggested sending a copy of the finished DVD to Jerry Yarnell, a 30-year veteran of a popular painting show on PBS. The Yarnell family was so impressed with the product that they agreed to list it on their popular website at www.yarnellart.com. Mirja Vahala’s DVD offers over 2.5 hours of content focusing on basic instruction for new artists. Starting with brush handling, tinting and shading, through to the basics of the colour wheel, gradations, blending, glazing and painting a landscape, this DVD is offered for $49. Mirja’s ability to provoke emotion in her own nature landscapes, and to articulate her methods to students have brought her some incredible teaching opportunities. Since moving to Castlegar BC in 2007 to pursue her craft fulltime, Mirja has instructed on behalf of Selkirk College and Holland America Cruises, as well holding classes in her own art studio. 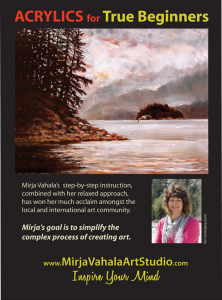 For more information on ‘Acrylics for True Beginners’, please visit www.MirjaVahalaArtStudio.com, or contact Mirja Vahala at: mirja@mirjavahala.com or by phone at 250-365-7679. © 2012 Small Town Films. All Rights Reserved.